Mainstays Bath Rug Collection:Non-slip backingFabric content: nylonCare instructions: machine washableAssorted colors and sizesDomestic Plush and thick, these Mainstays Bath Rugs have a soft texture that caresses your feet once you step in or out of your bathroom. It is beautifully crafted with 100 percent nylon, so is both durable and functional. Featuring an open-ended and plush yarn construction with rounded corners, this nylon bath rug will enhance the look of your bathroom decor. It features a washable, latex non-skid backing for added safety. 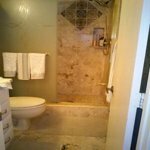 Coordinating Toilet Seat Cover and Contour rugs are also available. Softness, price, color, good quality It matched my shower curtain color perfectly (which coral was a hard color for me to find! ), decent price, it's soft and feels lovely under your feet, it doesn't collect water like other rugs have which is great and the size is good for my space. Great for the money.........this is the second time we bought these and love them, thin so the water dry's quickly. Very surprised how rich looking the coral color is. I am pleased with these rugs and they wash nicely. However, I never put them in the dryer as heat breaks down the latex backing. The is true for anything with a non slip backing. They will last much longer if hung to dry. Soft, generous size, seems to be durable. PERFECT MAT FOR THE BATHROOM. EXCELLANT COLOR AND BEAUTIFUL MAT TO STAND ON AFTER GETTING OUT OF THE SHOWER. The color is very rich and the rug very plush. Just what you see. Very nice rug. Good quality. Rug is longer than I expected. But very nice! The color is a very pretty coral, but I was disappointed with the match of color with the True Colors noodle bathmat that I thought would match, but the mat is a more intense color. Not horrible, but could be better. It would be nicer if the rug was a bit thicker, but the quality is acceptable for the price. I bought a second one for a back-up. 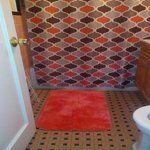 The rug does match very nicely with the Mainstays True Color bath towel set. They were nice rugs but the blue color pictured on the website was not the actual blue color of the rugs I received. Returned.